Particulate Analysis testing includes procedures for removing, counting, and sizing particulate contaminants on or in medical devices, stents, catheters, pharmaceuticals, IV bags, and contact lens solutions. This test is useful for determining the amount of particulate matter coming from the manufacturing environment and use of the medical device or pharmaceutical product as well as identifying the potential sources of particulates. Nelson Labs performs both USP recommended methods: Light Obscuration (via the HIAC Royco particle counter) and Microscopic as well as EN 45502 and ISO 14708 for implantable devices, USP <789> for ophthalmic solutions, ISO 8536-4 and ISO 1135-4 for gravity fed infusion devices and accessories, ANSI/AAMI AT6 for autologous transfusion devices, and AAMI TIR for vascular devices. This Particulate Analysis procedure is taken from the United States Pharmacopeia Method <788>, which gives criteria for injectable solutions. Solutions are mixed by inverting 20 times, allowing the solutions to degas, then analyzing on a liquid particle counter. Devices are extracted with an appropriate solvent such as low particulate water by flushing, rinsing, or orbital shaking. The extracts are degassed and tested on the liquid particle counter. There are currently no USP requirements for medical devices. The particle counter withdraws not less than three aliquots, of not less than 5 mL. The liquid particle counter is capable of calculating the average cumulative counts, average differential counts, average cumulative counts per mL, and average differential counts per mL. Per the USP, it will automatically omit the data from the first run. The size ranges used for USP testing are ≥10 and ≥25 μm. The liquid particle counter is capable of sizing and counting particles ranging from 2.0 μm to 150 μm. It will count particles larger than 150 μm, but will not be able to accurately size them. Sponsors may select any particle size range(s) between 2.0 to 150 μm appropriate for the test sample. Some injections cannot be tested by light obscuration (Stage 1) for technical reasons. Examples of such products are emulsions, colloids, liposomal preparations, and products that produce air or gas bubbles when drawn into the sensor, such as bicarbonate-buffered formulations. For these products, microscopic testing may be used exclusively. 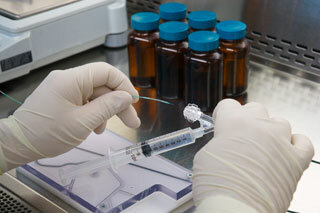 The procedure is taken from the United States Pharmacopeia Method <788>, which gives criteria for injectable solutions. Devices are extracted with an appropriate solvent such as low particulate water by flushing, rinsing, and/or orbital shaking. Solutions, whether device effluent or liquid sample, are filtered through a pre-cleaned, 1.0 µm or finer pore size, membrane filter. After filtration, the membrane filters are placed into petri slides and dried. Microscope slides are analyzed under a microscope, using a calibrated graticule, at 100X magnification. Using oblique illumination at an angle of 10˚ to 20˚, the particulates on the surface of the membrane are sized and counted using the graticule micrometer. The size ranges used for USP testing are ≥10 and ≥25 μm. Additional sizes can be enumerated ranging from 10 µm to 1,000 µm. Sponsors may select any particle size range(s) between 10 to 1,000 μm as appropriate for the test sample. In addition to sizing and counting particulate matter, photos and general characterization of particulates can be provided upon sponsor request. The test is an automatic particulate analysis which is specific to active implantable medical devices such as pacemakers, leads, and other accessories that may be partially or completely implanted. The device and accessories are immersed in physiological saline using a surface to volume ratio. The device is then incubated on an orbital shaker for 8 to 18 hours. The solution is analyzed using an automated particulate counter. The particles are enumerated for particles sized >2 µm, >5 µm, and >25 µm. NOTE: Surface area or volume of the device and accessories are required for calculations. The test is an automatic or microscopic particulate analysis for ophthalmic solutions. This standard is similar to USP <788> but includes specifications and instructions specific to solutions that have ophthalmic applications. For microscopic testing, ≥50 μm particulate sizes are evaluated in addition to ≥10 µm and ≥25 μm for the light obscuration method. The test is a microscopic particulate analysis which is specific to gravity fed infusion devices and accessories used in gravity fed infusion. The specification is provided as an ‘N’ value (also known as the contamination index) which is calculated using enumerated and sized particles ranging from 25-50 µm, 51-100 µm, and ˃100 μm. This test is a microscopic particulate analysis of which autologous transfusion devices must adhere to for a variety of physical tests including particulate matter requirements. The device is filled to volume with low particulate water. The water is then drained, collected, and filtered through a membrane filter, followed by a microscopic particulate enumeration of ≥10 µm and ≥25 μm particle sizes as well as fibers. Nelson Labs also has a great deal of experience in the new regulatory guidance documents regarding particulate matter testing of vascular medical devices. Services include assistance in developing custom test procedures to simulate the use of the device, procedure validation, full service extraction, exhaustive rinse and analysis, and assistance in composition analysis of particulate matter. For large volume injections, individual units are tested. If you have additional questions about Particulate Analysis test services, or would like to consult with the experts at Nelson Labs, just send us a request or call us at +1 (801) 290-7500.